Star Trek: Attack Wing Wave 30 Reviewed — GamingWithSwag.com - Dads By Day, Gamers By Night. Hello fellow students of Star Fleet Academy! Today I'm coming from the far corners of space to take a look at a few recent expansions for Star Trek: Attack Wing. In case you're unfamiliar, WizKids releases expansions for this game in waves, with each wave having 3 – 4 different ships which are either new ships or reprints of previous releases. There is a ton of content in each pack. Each one contains one miniature, various tokens, and a whole slew of upgrade and crew cards. Today we'll be looking at the three expansion packs from wave 30, all of which are reprints from old waves with updated paint jobs. What's inside: The U.S.S. 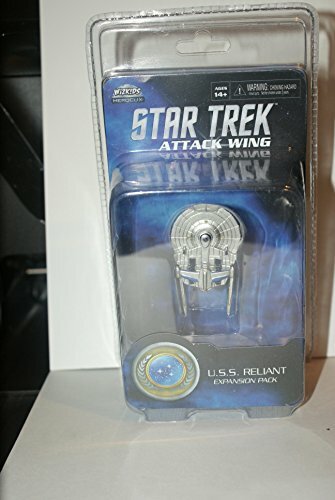 Reliant expansion reprints a Wave 0 Federation ship with an updated metallic color scheme. You also get some tokens for the different captains, a set of target locks, and the various upgrade abilities. As for the cards you get two ship options (the bare bones version and the advanced version), three upgrades, four crew, and three different captain choices. My thoughts: First things first, the original color scheme on this ship can only be described as “teal overload”. The new metallic colors look WORLDS better and the blue highlights really bring the whole thing together. The cards in this pack are all pretty decent and it's nice that they split the the crew cards between federation crew and the augmented super soldiers. However the best part of this expansion is a single captain named...KHAAAAAAAAAAN!!! Not only is it fun to play with the best Star Trek villain of all time, his card is really good to boot. Khan has the ability to use any upgrade without paying a faction penalty, making him very versatile. He can also spend a battle station token to turn all battle station results to hits. If playing with Khan isn't enough, the included scenario lets you replay the finale of The Wrath of Khan in the Mutara Nebula. The close quarters of this scenario gives you a real "knife fight in the closet" feel and does a good job conveying the tenseness of the movie. 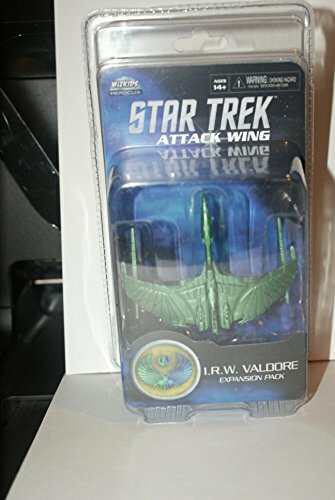 Star Trek Attack Wing IRW VALDORE 2017 Wizkids expansion Repaint Metallic I.R.W. What's inside: Time for another reprint, this time its of another of the first ships coming out of wave zero. This one has the obligatory captain and target lock tokens, as well as a large token used in the special scenario. The card content consists of three captains, three upgrades, and one crew. My thoughts: For once the new paint job doesn't blow me away. Of course that's mainly due to the fact that the old paint job looked pretty good already and the new one is similar with a metallic upgrade. If it ain't broke, don't fix it. This ship is pretty strong. It's fairly maneuverable, like most Romulan ships and if it does a green maneuver you get an extra attack die for the rest of the round. The captain card Donatra is also a powerful addition to any Romulan fleet. She give a bonus attack die to any ship within a range of one, so if you like to keep your ships in a tight formation she's a must have. What's inside: In the final expansion here we got the I.K.S. 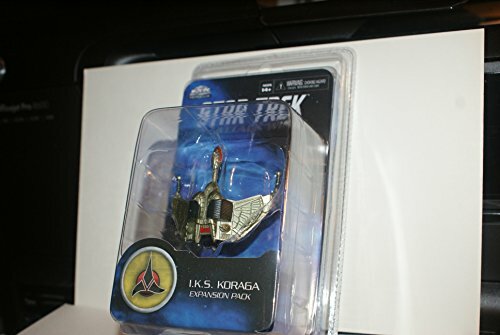 Koraga, a Klingon bird of prey originally released in Wave 2. In addition to a re-painted ship , you get a huge pile of tokens for the different captains and their various card related abilities. When it comes to cards you get three captains, three upgrades, and two crew members..
My thoughts: In my opinion, this is far and away the best looking re-paint I've seen yet. They upgraded to a vibrant silvery gold color scheme from an ugly pea green ship. I've said it before, but WizKids is doing a fantastic job with these repaints. 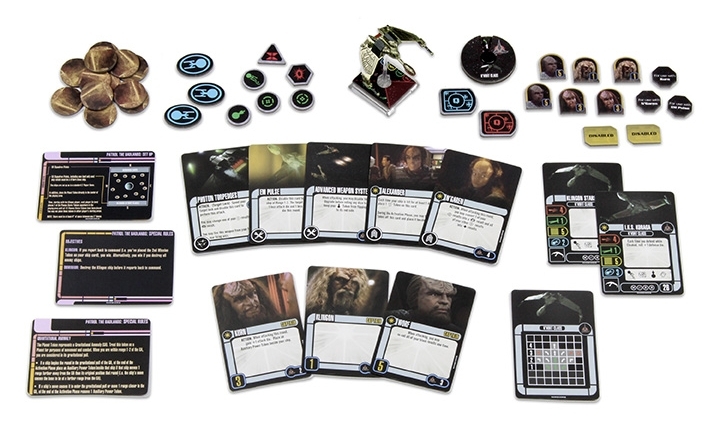 When it comes to the cards in this set, this one is a must have for Klingon lovers, as you get both Captain Worf and his son Alexander, who is the standout card in this set. While having big daddy Worf as a captain is fun thematically he can't hold a candle mechanics wise to his son. Alexander allows you to add a free battle station token each time you are hit. This endless stream of tokens allows you to do more important things like cloaking. The mission in this set is pretty interesting too. It has asymmetrical win conditions and a number of cool terrain in the form of plasma storms and a gravitational anomaly.